It is Wednesday night, and we just finished our final show for The Start of Winter Pledge Drive. To say that I am in a pensive mood would be an understatement. Saying my heart is moved with compassion for all who are involved in the Gospel Revolution is wholly insufficient. Let me do my best to explain. When I write “Dear Family”, that is how I feel. I really see us as a major part of each other’s lives. None of us knew when we were growing up how extensive our family tree truly would turn out to be and how we would touch each other. My memory of my early childhood is truly remarkable. I remember things from an extremely young age. One of the earliest memories involves my glass baby bottle with its trademark black cap. We were far from wealthy people. Still, I have no memory of feeling poor. Yet, now I know we were. The home I grew up in was about 700 sq. ft. with two very small bedrooms with the 6 of us kids and our Mom and Dad. Two sets of bunk beds lined the walls of the one small bedroom and my baby bed was at the foot of one of them. I slept in that crib so long that eventually to be able to stretch out my legs I would have to put them through the spindles to stick out my feet! My oldest brother slept on a cot in the living room. We ate well. The reason I have forced myself to learn how to make cornbread, sausage gravy and biscuits, cherry cobbler, and a damn good chili is that they are my comfort foods from childhood. Momma was an amazing cook. I pretend mine is as good as hers. However, my greatest comfort was that even-flow glass baby bottle. Dad worked as a delivery truck driver for “Model Dry Cleaners”. Our only form of transportation at that time was his company’s cream colored black lettered panel truck he drove for work. On Saturday nights we would all load into the truck which only sat two in the front. Buckets turned upside down, pillows and blankets were the kids’ seats. And off to the Drive-In Theater we would go! 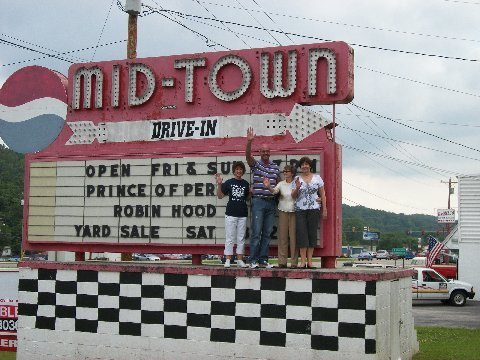 (Yes, that’s me and three of my sisters just a few years ago at the actual Drive-In pictured above with the same sign still there!) We did not yet have a TV so this was a real treat. After we arrived at the Drive-In, the blanket was spread in front of the truck for “festival seating”. One of the last movies I remember seeing with my family there was “The Ten Commandments” with Charlton Heston in 1956. We got our first TV soon after and never went in the panel truck as a family to the Drive-In again. Life had changed for the big family in the little house. On one of those trips back home after the Drive-In, I pretended to be asleep so my Mom would have to carry me in. My glass bottle was tucked under my arm, but it slipped out and shattered on the concrete steps to the stoop by the front door. I did not pretend to be asleep any more but began crying inconsolably. My Mom promised to go get another the next day. I cried myself to sleep. The next day she returned from shopping. I had waited anxiously for the new bottle. “Mikey, the store is out of bottles, she told me.” Several days of emotional trauma followed before my first night without crying myself to sleep. I had to grow up. Now it is Thursday morning and I am still reflecting on last night’s show. This time last week my daughter Audrey flew back home after a one week visit here. It was a wonderful time. Audrey is my daughter who was molested from ages 8 to 15 by her brother-in-law, my son-in-law Jason who had been a trusted family member, to say the least. As Audrey and I spent time discussing the Gospel during her visit, the subject of the monumental difference between before and after the Cross came up. I explained how that instead of us being in God’s image as we were before the Cross that now we and God are ONE together, no longer two separate entities. We discussed how that under the First Covenant we were called children of God, but now under the Second we are no longer children but we are sons! And in the same way we have to grow from children to sons in this life, we have to do the same thing in our understanding that we now are ALL Sons of God! Audrey responded, “So, God is IN us now, not outside, not someone we ask for help or to intervene because NOW we are ONE!” “YES!” I exclaimed. I was so excited she understood. In all my time thinking of Audrey, her challenges, our family, and everything surrounding it, what Audrey said next to me had never even crossed my mind. “What do you mean, Babe?” I asked. Now I am sure you are asking yourself what the hell do last Wednesday’s Webcast, a broken baby bottle, sausage gravy, and a molested child have to do with each other? Well, as it turns out, quite a bit in every way. As I’ve traveled down this glorious Gospel road over the years, and as I contemplated the message of God’s eternal love for all people, it became evident that as I considered the implications of each aspect of the Gospel that I needed to put many aside for awhile—sometimes for years—before attempting to teach on them. Like children who must grow up, over the last several years it has been time for us to go public with them for our consideration. One perfect example was the whole issue of the confession of sins. Simply stated, if sin is done away with at the Cross, and we know it was, then we no longer need to confess sins! In the oddest way confession of sin was a temporary comfort for us all, like my old glass baby bottle or your childhood pacifier. In reality, prayer left my daughter feeling powerless and defenseless. Then the Gospel empowered the same girl! It’s tough to grow up, no doubt. It’s hard giving up the things that comfort and soothe us even in the shortest of runs. Yet, it is nothing short of empowering when we do! I had to give up my bottle. We ALL have to give up confession of sins AND petitioning God for stuff! Even though we indeed were once comforted by these childish activities, by giving these “comforts” up, by repenting or changing our minds, we gain power and are stretched and we grow! The gravy and biscuits? No, you don’t have to give up those comforts. In fact stop by my home sometime. I will make a fresh batch and we can sit at my table and talk about the Power of God, the Gospel of Peace and Grace, and its destiny to change the future for all Humanity like it did for Audrey and her Dad. I make a good cup of coffee, too!